Thank you for making the contest a success! The 2017 Contest is now closed. We received hundreds of incredible entries from 29 countries. The talent and imagination of the kids in your lives astounds us! We love the creative ideas for enjoying outdoor spaces, whether they're cupcake gardens, treehouse movie projectors, flower-wrapped climbing walls, Batman racetracks, sustainable energy generators, or zombie catchers. These activities are the perfect chance to talk about the environment with little ones — practicing spatial understanding, artistic expression, and writing skills in the process. Check back for information on the 2018 contest, coming this fall! A panel of talented artists, educators, and landscape architects will be selecting one winner from each age category (7 + under, and 8-12 years old). They'll be looking for creativity and artistic clarity in the winning submissions. Our four jurors will select a Grand Prize winner from each age group. Winners will receive an award certificate, recognition on the YardKit website and social media, and their choice from the prize collections below. Plus, because we love presents, we're also giving a surprise gift to an entry drawn randomly, just for participating. 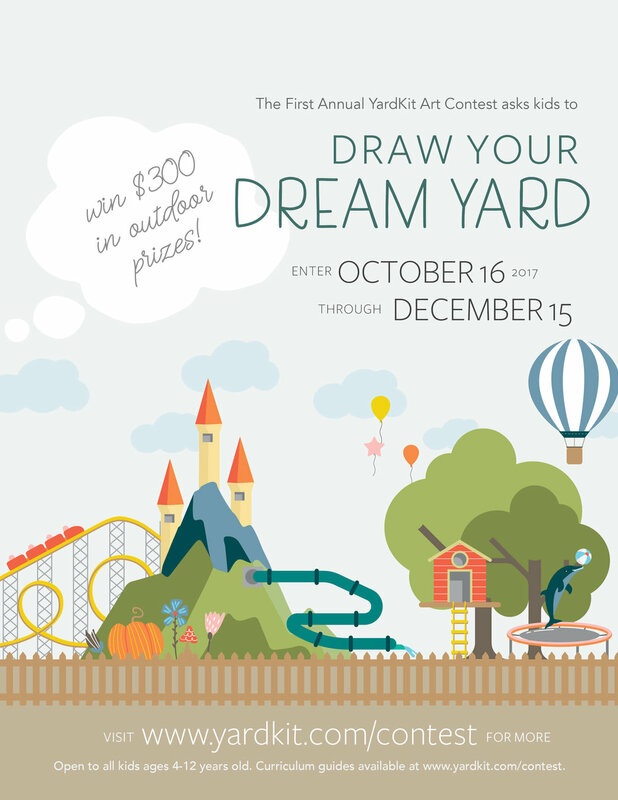 Parents and caregivers will receive a 15% discount coupon for a YardKit purchase with each submission.